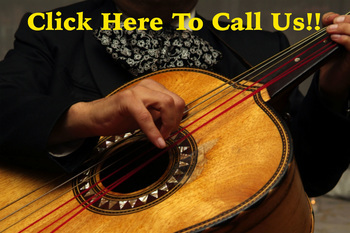 Make sure you have the most popular mariachi songs of all time so everyone can sing along a little! Are you looking for a unique wedding entrance song that has deep cultural ties? Your ceremony could be made even more special with classic mariachi love songs! Pick up your phone and call 832-681-0414 today for a free quote! We won't bite, we promise. Make sure you ask us about our mariachi wedding songs if you're unsure. Take our word for it, there is plenty of mariachi wedding music that we can play at a moment's notice. We are professionals, after all! I mean, seriously... If you haven't been to a mariachi band wedding, then well... Why haven't you? They're some of the happiest and most festive wedding ideas of all! The highlight, of course, is when the band plays the mariachi wedding march. We don't have to say it for you to know that this is the most important mariachi wedding entrance song of all! Not to mention that mariachi wedding dresses and wedding suits are incredibly regal and fashionable! Plan the wedding dance of a lifetime! This part comes really easily when you have a mariachi band at your wedding ceremony. We'll guide you through all of the traditional dances and make sure that everyone is happy and having a great time. Of all the wedding dance traditions, the mariachi style has to be one of the most colorful and exciting of all! We have plenty of wedding dance songs for every type of crowd, just ask what we can do for you! If you're looking for a surprise wedding dance, we would like to invite you to learn one of the traditional mariachi wedding dances. Maybe, just maybe we'll teach you! Just ask. There are few funny wedding dances that are as interesting as this one. So what are you waiting for, huh? Call us at 832-681-0414 for a free quote today! Mariachi weddings have been a staple of families in Mexico for centuries. Over the course of many years, the tradition has spread to other countries such as Colombia and the United States by immigrants. Luckily for you, Mariachis En Houston has some of the best deals and reviews of all the local bands. Just check out our deals and promotions that we offer from time to time, as well as coupons to local restaurants and other venues so you can enjoy your night in style! And after the wedding vows have been exchanged? Let the after party commence! It goes without saying that this is the funnest part. As we say at Mariachi Villa, let the good times roll! So what are you waiting for? Hit us up at 832-681-0414 or 832-949-8937 today!